Over time, certain parts of your kitchen might become damaged or simply become warn out from everyday usage. Our kitchen refurbishment service is designed to restore and modernise your kitchen. One of the main reasons why kitchen refurbishments are popular is that they are a quick and affordable way of creating entirely new kitchen decor. When it comes to kitchen refurbishment, there are several options available to you. If you find that your kitchen units and mechanisms are still in good condition, then changing just the kitchen doors would be a good choice to make. By changing the kitchen doors, your kitchen will automatically look new as they are the main visible part of the kitchen furnishings. We also offer a kitchen worktop replacement service and just by changing the worktop, your kitchen will achieve an entirely different look. Kitchen refurbishments offer a quick and affordable way to create entirely new kitchen decor. Our kitchen refurbishment service leaves you with a complete new looking kitchen and we achieve that in only a couple of days. As no heavy uplifting work is required, there is minimal amount of disruption and mess. 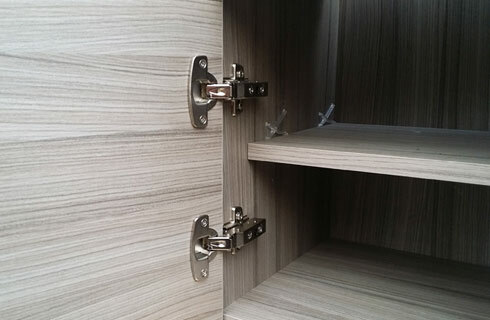 Replacing kitchen doors is a straight forward process where we can both update your kitchen doors but also install the all important soft close durable mechanisms. Here at Two Tone Kitchens we have one of the largest and unique made to measure kitchen door collections in the UK. If you are looking to replace your current kitchen doors then our made to measure kitchen doors are perfect for you. Our collections of kitchen doors includes both modern and traditional styles with an unlimited number of designs, colours and finishes available to you. You can even choose different material types such as acrylic, vinyl, lacquered, wood veneered, painted and unique door material collections such as concrete, ceramic and glass. 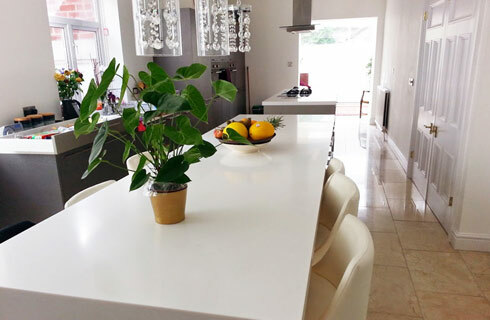 Our unique bespoke kitchen worktop replacement service allows us to template your existing worktops and fabricate your kitchen worktop replacement without removing the existing worktops. 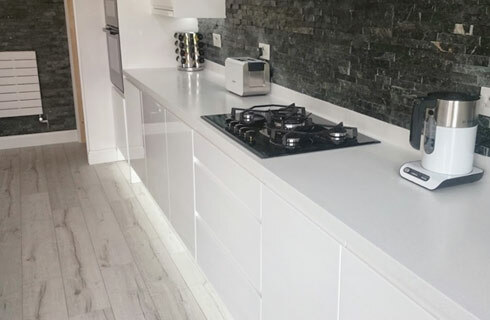 Using the template made, we can then fabricate your kitchen worktop in our workshop, that matches the thickness as well as shape and carry out removal and installation of your new worktop all in one day. 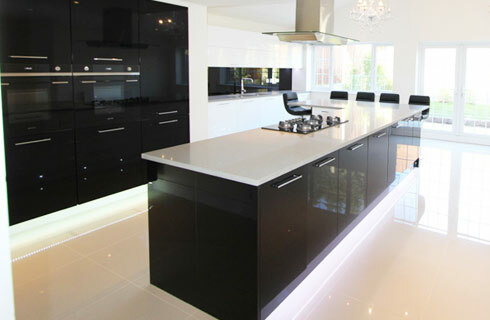 Here at Two Tone Kitchens we have the largest selection of kitchen worktop materials and designs in the UK. These include solid surface acrylic worktops, Quartz, Granite, Solid Wood and Ceramic worktops. If your kitchen cabinets have reached their end of life, then consider using our kitchen cabinet replacement service. All of our kitchen cabinets are bespoke made and can be fully customised. Our cabinets are made to any size and any shape required. Egger Zoom MFC collection features 112 designs for you to choose from. These include solid colours, premium wood, exotic wood, rustic wood and light wood collections. Our cabinets feature high quality award winning German mechanisms (Blum or Hettich) with soft close action as standard and are designed to withstand test of time.